English speakers also tend to weaken or omit final coronal consonants, a process that linguists call t/d deletion: thus [lɛf] for left. Although t/d deletion is stigmatized, in fact all normal English speakers do it some of the time, at least in some contexts. As a result, fixed expressions that start out as participle+noun are sometimes re-analyzed so as to lose their -ed ending. This happened long ago to ice(d) cream, skim(med) milk, pop(ped) corn, wax(ed) paper, shave(d) ice, etc. It's happened more recently (I think) to ice(d) tea, cream(ed) corn, and whip(ped) cream. A few weeks ago, reader JM reported one of these that's new to me: "bake goods" for baked goods, in a flier from his son's school. This one is definitely out there on the web. 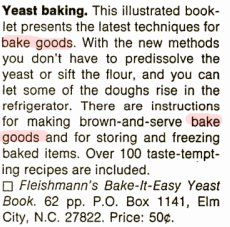 Some examples are in a context featuring some other non-standard spellings — thus one page advises us to "keep the kids happy and your time not waisted" by following its instructions on "How to Keep Your Bake Goods Soft"; and another page asks "How often do you make homemade bake goods? ", and starts the answer "I use to make several kinds of cookies each week…"
But other examples are otherwise pretty much standard: check out Mutt Face Bake Goods ("Treats for Dogs and their Pets") in Seguin, TX; or the Countryside Bake Shop in Auburn KY ("Along with bake goods we also do vegetable trays, fruit trays, meat & cheese trays, potato salad, chicken fingers, chicken salad, ham salad and the list goes on"), or this 2005 article in the Westchester County Business Journal, "New bake goods store gives all net profits to nonprofits". He was a practical baker and made such excellent bread and other bake goods that his modest establishment became the Mecca of tired housewives, who were thus able to eliminate baking from their household duties. So successful was this well conducted bakery that now, after fifty years of continuous operation, the name of WOLFARTH is synonymous of all that is pure, wholesome and appetizing in bread and bake goods. In both of those last examples, the phrase "bake goods" occurs twice in the same paragraph, making it less likely that it's a typographical error. The development of large, well-dated, searchable digital archives will eventually make it possible to study the population memetics of such variants in an empirically grounded way. Although you list it along with ice cream and wax paper, I had never before seen or heard of shave ice; that's completely new to me. I haven't heard "shave ice" either, though I am familiar with "shaved ice". I was interested in this because in that first list you provide, I only ever say the shorter variant of the words included, with the exception of "shaved ice", for which I've only ever heard (or, more probably, noticed) the longer variant. "Shave ice" is an interesting one because the initial vowel of the second in the phrase makes the d-drop a lot less likely (to my ear anyway). I would have expected some kind of eggcorn, like Shave Dice, but I wonder whether the drop is under analogy with the other dropped verb-noun phrases, like Ice Cream and Skim Milk. In the UK I think 'skimmed milk' and 'whipped cream' are still more widely used than the skim/whip variants – I'm not sure I've ever heard 'skim milk' or 'whip cream' here. BTW: For anyone planning a trip to Oahu, Matsumoto (near the North Shore) has the best shave ice anywhere: http://www.matsumotoshaveice.com/. Thanks for this entry. Interesting stuff. I'm gonna sit on my screen porch and have a snack — ice tea and bake goods. In the parts of the US in which I've lived, milk cartons are normally labelled "Skim Milk," and of course it's long been "Ice Cream." c1386 CHAUCER Prol. 343 Withoute bake mete was never his hous. Also, box set (of CDs, DVDs, etc) for what was at one time called a boxed set. Although it's very hard to retain the 'd' while saying boxed set without sounding affected. The difference between can and can't (when I say them) amounts to no more than a tiny lengthening of the vowel for the negative. The trouble starts when non-native speakers pick up on this. Today, as so often, I've had to ask my non-native-speaker wife, "Can or can't?" @ David L: "… boxed set. Although it's very hard to retain the 'd' while saying boxed set without sounding affected." Things like this provide ammo for me in the face of my mid-western friends, including the one I married, who find my (now very weakened) Brooklyn accent sometimes amusing. For them "merry", "marry" and "Mary" are homophones. any instances of reforming phrases to drop a final d/t that is not part of an -ed? Though I am one who rails against "ice tea", I had never even thought of "ice cream" and "skim milk" as being members of the same class. Popcorn, though, surprises me about the word and not about my own obliviousness. If it's a shortening of "popped corn", then what would people of an earlier era have called the golden kernels in a jar on my shelf? They aren't popped. I suppose it depends on what you mean by recent, but 55 years ago south of Richmond VA, ice tea and whip cream were absolutely standard, and I'm pretty sure it would have struck people as very strange if you had said iced tea, or even if you had spelled it that way (e.g. on a restaurant menu). The unpopped kernels are "popping corn". Not sure whether this URL will work, but "skim-milk" seems to go back at least as far as 1879. This is an 1879 libretto of W.S. Gilbert's "H.M.S. Pinafore." Towards the beginning of Act II (p. 18 of this edition), there is the famous couplet, "Things are seldom what they seem, Skim-milk masquerades as cream." Or is "skimmed milk" a back-formation? Or perhaps the two versions have coexisted for as long as cream has been skimmed off of milk. Actually, a little more research reveals that "skim-milk" goes back at least to Shakespeare. The first OED cite is 1 Henry IV ii, iii (1596). The first cite for "skimmed milk" is 1722. My (Canadian) grandmother called in "kernel corn" before it was popped, which confused me for a while. I don't know whether she called the cooked version "popcorn" or "popped corn." I'm surprised to see "dropped ceiling" in the first list rather than "drop(ped) ceiling" in the second. @Kate Y, maybe they would use the same phrase I do today: "popping corn". AFAIC it's not popcorn until it's been popped. "@ David L: "… boxed set. Although it's very hard to retain the 'd' while saying boxed set without sounding affected." Maybe affected is the wrong word, but for me, 'boxed set' is a lot harder to say cleanly than 'baked goods.' Something about the d coming between the x and the s means I have to over-enunciate to sound the d clearly, in a way that begins to sound precious. Whereas when I say 'baked goods' I turn the k sound almost into a glottal stop and the d follows more naturally. I'm sorry if this is an amateurish explanation — I don't have the knowledge or lingo to say it more precisely. The inclusion of popcorn in this list is more than doubtful. The OED first records popped corn in 1842 and pop corn in 1847, but pop corn in the sense of a variety of maize, rather the result of popping it, goes back to at least 1838, and possibly to 1819 (in the presumably misheard form poss corn). So apparently the two forms have been competing since the beginning. There are some 35 kghits for pass tense, some of which are puns, but many are simple eggcorns. So far only a few of these have reached Google Scholar, but one never knows. To me it's always 'skimmed milk', 'whipped (or whipping) cream', and 'iced tea'. The last one's interesting since 'iced tea' and 'ice tea' are pronounced exactly the same. I had always assumed this was a regional phenomenon. I often see homemade signs in New Orleans advertising things like "fry shrimp", "boil crabs", "mash potato(e)s", etc. Which, of course, makes it possible to comically misread them as commands. "You, in the white jacket! Fry shrimp!" I was interested to see "I use to…" in one of the quotations, since I know I've seen "didn't used to" at various times over the past many years. humm. I can't seem to make 'bake goods' work. it either stays 'baked' or becomes 'bae goods'. just testing out a lot of those examples to myself, whether they lose the t or d or not seems somewhat random. some are just awkward to say without their final t/d due to the sound before or the one after… but most aren't. The term “shave ice” may not actually be an example of this phenomenon because it is almost certainly via Hawaiian Pidgin. That language, also sometimes known as Hawaiian Creole English, doesn’t traditionally use the -ed past tense morpheme, instead having a periphrastic construction with wen (< Eng. went), e.g. I wen see em Saturday “I saw him on Saturday” (not “I went to see him on Saturday” which is I wen go see em Saturday), and he wen shave da ice awready “he has already shaved the ice”. In substantive compounds the stems are just bare so boil egg “boiled egg” (I think hard egg is more common), chrow net “thrown net (fishing)”, and of course shave ice “shaved ice”. These constructions may not be as common as they are in English, perhaps the mechanism is not productive. Interestingly, on the Big Island of Hawaiʻi the term is not “shave ice” but is instead “ice shave”. Decreolization, the process of a creole becoming more and more like one of its lexifier languages, is well underway in Hawaiian Pidgin. (This despite some linguists not believing in decreolization.) Most speakers, particularly urban residents, have full command of the local Hawaiian English dialect as well as Hawaiian Pidgin. Some educated people or youthful transplants also have command of General American English in addition to the local English dialect and Pidgin. In their speech people routinely shift back and forth along the continuum depending on social and political circumstances, often even in the middle of conversations. Thus it can be hard to tell when a given form is English or Pidgin, since even in a “deep Pidgin” context speakers will still code-switch the occasional English word or phrase. Here in southern Wisconsin, we say neither "baked goods" nor "bake goods." Everyone calls that stuff "bakery." This causes foreign types (eg. flatlanders) some trouble, as when someone comes into a bakery late in the morning and asks "is there bakery yet?" The preferred answer is "You bet," although "Sorry, hon" happens on occasion. I saw a hand-written menu board outside a cafe in Sydney (Australia) last weekend that offered not just "Caramelize Apples" but also "Caramelize Pears" – whoever wrote it, wrote it twice. An elderly Scot of my acquaintance used to summarise the unfairness of life as "some get the cream and some get the skim". I'm not sure about burn toast, in my southern England accent I pronounce it [bɜ:nʔtʰəʊst] as opposed to the action [bɜ:ntʰəʊst]. In The Rachel Papers by M. Amis Charles the hero suffers from an over production of mucus. On one of his souful walks in London he gives a homeless guy some money and the guy thanks him "Gob less you." "I'll try," he replies to himself. I have also noticed knitted reduced to knit as in knit socks, knit hats, etc. I see it most often in thin-knit sweaters. @Jessica Montgomerie: I always parsed that use of "knit" as analogous to "weave", i.e., a noun, not a verb. @richard: That "bakery" to mean "baked goods" was used by some people where I grew up near Chicago, but it always seemed odd to me. I noted earlier that the first OED cite for "skim milke" is 1 Henry IV ii, iii (1596). However, the OED s.v. "skim-milk" also records that the 1623 folio edition printed "skim'd Milk," which suggests that the printer analyzed "skim milk" of the earlier edition as an instance of coronal deletion and that the hesitation between "skim milk" and "skimmed milk" goes back at least to Early Modern English. Is "skim milk" a true example of t/d deletion or have the two variants coexisted since time immemorial? Does anyone know when English speakers started deleting their coronals? I still make a distinction between "whip cream" and "whipped cream": Whip cream comes in a can and you shake it, and whipped cream is heavy cream that had been put into a bowl and whipped. I'll admit, it's mostly a leftover misunderstanding from childhood, but it still makes sense to me. They definitely don't taste the same, "whip cream" in a can certainly isn't whipped, and sometimes it isn't even cream. Here, the past participle has been replaced by the present for a strong verb where there is no final coronal!! So obviously something more than the loss of the final coronal is going on here. c1340 Cursor M. 2021 (Trin.) Drunke [earlier texts drunken] he lay & slept bi his one. a1450 Knt. de la Tour (1868) 72 One counsailed to make hym gret chere tyl he were dronke. 1532 MORE Confut. Tindale Wks. 591/2 We ware wanton or sowe dronke. 1585 T. WASHINGTON tr. Nicholay's Voy. III. ii. 91 They doe not thinke they have made good cheere..except they be made beastly drunk. And the phrase "drunk driving" is the standard one, at least in the U.S., and as far as I know has always been the standard one, so if you're seeing it more often than "drunken driving", it's because you're reading things written by people who know the appropriate usage in this case. Very interesting, if the phonological reduction has fed a semantic reanalysis. However, I wonder whether it might be a different process at work. Around the time of my childhood, media seemed to be consciously pushing the term "drinking and driving" over "drunk driving", since, of course, significant impairment behind the wheel happens long before the state that we ordinarily call "drunk". If drink driving is a reduction of drinking and driving, then it would make sense to say, "Yes, I was drink driving last night, but I wasn't drunk", but with "drunk driving", it would be contradictory. Hi, I got confused. I just learned "drink driving" does not actually derive from "drunk driving" but is British! British : driving a vehicle while drunk"
So American is "drunk driving" and British is "drink driving". It is just coincidence that "drunk" is the past participle of "drink" in this case!! The 'yet' in Is there bakery yet? is used to mean 'still', right? As in: Are baked goods still available? I grew up in WI and haven't heard that usage anywhere else since …. There's "jerk/jerky/jerked chicken" and "jerk/jerky/jerked beef" as well as "chicken jerky" and "beef jerky" but I don't know which is used where or even if they're the same thing. Corrupted from American Sp. charque-ar in same sense, f. charque, charqui, ad. Quichua (Peruvian) ccharqui ‘dried flesh, unsalted, in long strips’. The verb in Quichua was ccharquini ‘to prepare dried meat, to jerk’, whence perh. the early cognate JERKIN n.3 The word is now used in all parts of Spanish America, and was app. found by English navigators in Spanish use in the W. Indies. (See Skeat, Trans. Philol. Soc. 1885, 94. Whipped cream has been whipped and whipping cream is cream for whipping (like popping corn) in my BrE. Is there "whup cream" ? wonder? There's a slight difference between wax-paper or ice-cream, which are arguably mixtures of wax and paper or ice and cream, and "shave ice" or "skim milk", though I don't know what that's got to do with anything. Edit: Is there "whup cream", I wonder? I just learned it too! Is this just down to the d/t sound? I always assumed it was a more general inflection-dropping, analogous to the one that has led to US "fry pan" vs British "frying pan". [(myl) There are lots of cases where nouns in -ing and in -∅ have meanings that overlap enough for both to be plausibly used in compounds with similar meanings — thus you could say "skiing vacation" or "ski vacation". Sometimes one or the other happens to be chosen as the form used in a fixed expression: tackling dummy, swimming pool, vs. ski lift, balance beam. The non-standard variant in each case is semantically plausible but lexicographically unexpected: tackle dummy, swim pool, skiing lift, balancing beam. And sometimes such fixed expressions are geographically or socially variable, as in the case of fry(ing) pan. In the case of pairs like ice(d) tea, similar remarks can apply to the choice between a participial adjective and a noun (whether as part of a compound or as a modifier). Both choices are syntactically and semantically plausible, but one of them may be sanctioned by usage, and the other not. Some of us Americans say frying pan. Yes, they were dried, not various. That reminds me of Martin Amis' dad, Kingsley Amis – making fun of people who say 'corm beef' for 'corned beef'. I must say it brings out the pedant in me when I hear people saying 'box set' instead of 'boxed set' – it's a set in a box, not a set of boxes. The other thing that drives me mad is that nobody in England seems to say 'fifth' or 'sixth' anymore. It's always 'fith' and 'sickth'. Is the expression "Out of the frying pan, into the fire" ever used with "fry pan" instead? I grew up in New Jersey, where goods in cans were always "canned goods". Now I live in Oregon, where they are "can goods". I've gotten used to it for the most part, but the one that still bugs is "can fish". It sounds like a species I have no wish to ingest. Many of these comments would have been more helpful if they had stated clearly whether they were reporting written spellings or pronunciations they (thought they) were hearing. If Dorothy L Sayers's stories of Peter Wimsey are a reliable source, then the UK, while still using skimmed milk, decorate their houses with "pot plants" while we still used "potted plants". I believe the form appears in Busman's Honeymoon. I have not heard the form "whip cream", "whipped cream" is more familiar to my ear. Unfortunately, we have to use whipping cream to make whipped cream, rather than cream. The real stuff is no longer available in the US, except directly from dairy farmers. @Adam & @Chris, I have always been told by German and Dutch speakers that the use of "bakery" for "bake(d) goods," and the use of "yet" to mean "still," probably come from the heavy influence of German and Dutch in Wisconsin English. Other common examples I have heard over the years: "go by the store" (by = to), verb + up ("wait up"), verb + once ("come here once"), "bend the corner round" ("go around the corner"). The DARE people could probably support or refute the German/Dutch connection, but it's certainly true in my experience that the constructions are more common in Milwaukee (German settlers) and Green Bay (Dutch-Flemish settlers) than in Madison (Anglo-Irish settlers in a pool of Norwegians and Swedes). Here in the south, we ask for "unsweet tea" if we want what northerners call iced tea — dropping not only the "ed" but also the "en." If you ask for just "tea," it comes sweetened and iced. If you want what northerners think of as "tea," you have to ask for "hot tea" (which, unlike iced, comes unsweetened). Regarding the relative antiquity of various forms of popcorn, genealogybank turns up this, from the Edwardsville (Illinois) Spectator of June 26, 1821, reprinting an item from The American Farmer of Franklin, Missouri of March 3, 1821. It includes a discussion of varieties of corn, including "The Pop-corn, as it is vulgarly called". The earliest example of "popped corn" is from 1842. I suspect it is the same cite as the OED has. There is also a report from 1843 of the marriage of Mr. Morgan Popp to Miss Susan Korn. Some newspaper editor could not resist the temptation to title the snippet "Pop-Corn". If nothing else, this shows the word was common enough to inspire puns. Is there any regional dialect where "fry pan" is the norm? On Star Trek, you have to ask for "tea … Earl Grey … hot". Such advanced technology. In my future, it will just know when you want tea, and what kind, and have it ready with a squirt of brandy in if you want, without embarrassing yourself. Also a jet pack. I can attest that there is no way that shave ice could ever have been called "shaved ice" among any population outside a military base in Hawaii, so it's not a proper example. Incidentally, it's "ice shave" on some islands, "shave ice" on others. @Brian Johnson: a "knit cap" is a cap that has been made from fabric that is knit; it's not about a verb, it's about the type of fabric. A "knitted cap" is a cap that has been knitted. This allows a distinction between a cap from the Gap that has been sewn from knit fabric ("knit cap") and a cap from your Grandma that has been knitted by hand ("knitted cap"). Of course in practice most knitters would use the term rather interchangeably… but it's nice to be able to have the distinction handy. I use this example as an illustration of possible language change. Suppose English did not have a rule that permitted nouns as prenominal modifiers, but it did have the past participle and coronal rules. Thus, within a generation or two, you have new speakers learning "ice cream" and "wax paper", with the possible re-analysis as noun+noun, leading these speakers to generalize to other noun+noun combinations that did not arise from past participle-d+noun. Voila, the language now contains a rule that nouns can be prenominal modifiers. It is, of course, not how it happened in English — which presumably inherited noun+noun from proto-Germanic compounding — but I think it's a pretty good example for engineer-types who respond to the rules and the realization that different rules can produce the same output. "Very strange to see Godfather quite suddenly picking a stuff animal off the street in this commercial. Glad to see hes out there!!!" I was always confused about the dismissive phrase 'I could care less.' Because if you could care less then you do care some. I guess the n't got lost along the way somewhere. Regarding dropped "-d" at the end of certain words: Has anyone else noticed another instance of dropped "d" on a verb: "you had better/you'd better" do whatever has more or less disappeared, and instead we have "you better do it." "The reforms, announced by Prime Minister John Key and Social Development Minister Paula Bennett last week, would cracked down on sickness and unemployment beneficiaries, tighten eligibility, and reduce benefits for some who did not comply." I read them, but resist the temptation to reply, since around here they seem to go the way of – well, day old bake goods – in record time. On the upside, they only cost half as much to read.